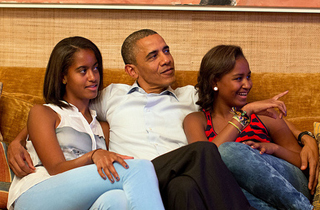 Obama: My Kids Probably Won't Run for Office, They've Been 'Listening to Their Mother"
In an interview with Tom Joyner for Black America Web, President Barack Obama spoke about the legacy of Selma and the passion for civil rights he wants to pass down to his daughters. Obama, who will be attending the 50th Anniversary celebration of the March on Selma, told Joyner that despite the advances America has made in securing the rights of African-Americans, there’s still a lot to be done. SYBIL: How would you like to see your girls you passing that charge to them? How would you like to see them complete that? PRESIDENT OBAMA: Well, you know, I think that, look, everybody’s got a way to give back. You know, I am very doubtful that they will want to run for public office, you know, partly because they’ve been listening to their mother. PRESIDENT OBAMA: But I want them to be engaged and involved, right? And so if they want to do it through business, then I want them to have a business that is providing employment and opportunity for people who might not otherwise get it. If they want to do it through the arts, then I want their art to be informed by the great social issues of the day so that they’re illuminating that for other people and telling stories that need to be told. Given the way the media flips out whenever someone finds an Instagram photo of Malia wearing a t-shirt, or how congressional staffers insult the girls over something like a cardigan, it’s probably the right decision, and certainly the least toxic one. Do business school!